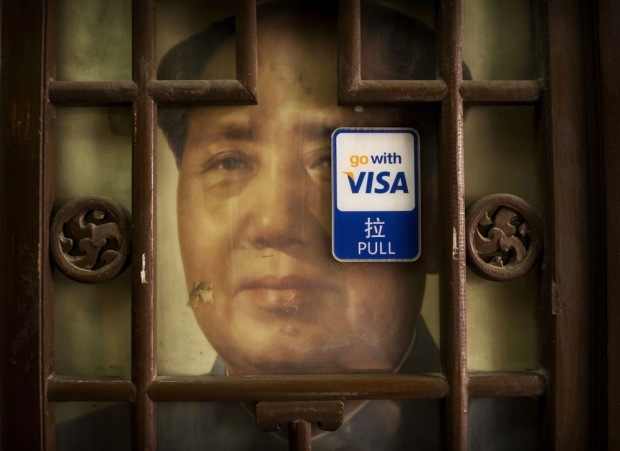 A portrait of the late chairman Mao Zedong partly covered by an advertisement for an American credit card company at a vendor’s stand at a Beijing market. By Hu Shuli, a Caixin staff reporter. This editorial was first published in Caixin. China's securities law is to undergo a comprehensive revision almost a decade after the last major overhaul. Public consultation is due to start in the first half of next year, following recent comments from officials, scholars, and market participants. The first national law of its kind was introduced in 1999—almost a decade after the establishment of the country's first bourse, the Shanghai Stock Exchange in 1990—and sought to create greater uniformity in the rapidly expanding securities market. The law, which protects investor rights in shares and bonds, has undergone amendments major and minor over the years. Yet too much government regulation, or "financial repression," remains. The law certainly needs a systematic overhaul. As the government streamlines administration, delegates powers to lower levels, and deepens reform, the changes must also help redefine the functions of government and the market. Calls to amend the law have been heard for some time. Opinions are divided over changes, in particular whether securities regulators should move from an approval-based system of initial public offerings, which can involve rounds of reviews lasting many years before permission is given, to a registration-based system—widely adopted in developed economies—where companies and investors set the scale, valuation, and timing of new share offerings. The problem with the current system is that China's capital market has developed much more slowly than the economy and has thus impeded the nation's development. This is why it is now vital to solve the core problems of China's capital markets. In essence, the new amendments will allow for greater market autonomy and improved market mechanisms. The relationship between the regulator and the market also demands attention. Regulatory powers can be a positive force protecting the market; unfortunately, they can also be used as rent-seeking tools. So, we must consider how such powers are distributed, and provide adequate checks and balances. Registration rights will continue to be a key issue and this must be handled with care, given the excessive concentration of power in the China Securities Regulatory Commission at present. The allocation of powers and checks and balances also affects more than just the securities regulatory authorities, so it is important to ensure supervisory roles are separated and promote the coordination of securities-related business between government departments. Before a consensus is reached, changes must of course reflect market realities. For instance, major shareholders often ignore the interests of other shareholders, and there have been many cases of insider trading. Yet important mechanisms for protecting investors still lag behind. For quite a while now, there have been problems with the standard and development of the country's securities markets. This is apparent in the relationship between small investors and small and medium-sized enterprises (SMEs). While small investors' rights and interests need to be protected, SMEs also require more efficient capital markets to be able to develop fully. Thus, a balance is needed. Accountability must be addressed, too, including both through the regulatory commission's administrative penalties and also mechanisms for civil and criminal litigation. Rules relating to the disclosure of sensitive information are regularly flouted, and regulators have all too often proved ineffectual. Also, few legal channels exist to protect civil rights. Market players and legal experts have continued to call for an end to certain preconditions, such as one that means that securities-related litigation can only be heard in civil courts after the regulatory body makes a decision. Authorities' response to this will be a true litmus test of whether they are sincere about wanting to protect investor rights. The amended law must also foster a multi-level capital market, where IPOs and private placements are separated, with their own investor groups, regulatory standards, and appropriate levels of liquidity. When raising funds in IPOs, rules about information disclosure ought to be coupled with sound regulations. However, where possible, the market should be allowed to play a decisive role. The capital market has grown rapidly in the past 20 years, but its breadth and allocation of resources are hardly satisfactory. The latest revision offers a major opportunity to liberalize the market and the rule of law. Starting today, the preparations, discussions, and eventual implementation of the changes will contribute to the upgrading and maturing of China's capital market, and will be closely linked to reforms in other areas, both today and in the future. While we should tread carefully, we must also keep our eyes firmly on the horizon.